In 2008, having worked for Carbide Tool Works Ltd. for 25 years, I seized a business opportunity to purchase the company, in a time when many businesses were closing. I didn’t want to end up with any regrets in my life so I chose to restructure the company, economize all facets, and grow. 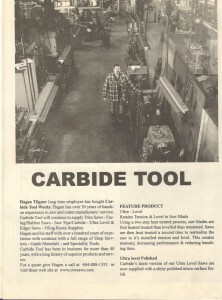 Having worked in every position in the company from millwright to machinist, and shop foreman to sales, I knew everything about the production, service, and repair of Carbide cutting tools. I’m frequently asked to design and manufacture customized cutting tools to solve unusual situations where drilling through complex or hard-to-reach areas are not possible with standard equipment. With the strength just shy of a diamond, Carbide can cut through rock. For this reason Carbide is used in saw and drill equipment for demolition, sawmills, tongue and groove flooring, and by fire fighters in emergency situations, to name a few.